Tom Ford overcame gastroenteritis to hit a maximum 147 break and whitewash Steve Davis 4-0 at the Royal London Watches Grand Prix in Aberdeen. The qualifier had been rushed to hospital after being taken ill in the early hours of Sunday morning. The Englishman, ranked 50 in the world, discharged himself so he could play and rattled off three successive centuries despite suffering severe cramps. Ronnie O'Sullivan and Peter Ebdon reached the last 16 knock-out stages. Ford, who inflicted a third defeat in the group stages to ensure former world champion Davis' elimination, said: "My stomach has been really hurting. I don't know how I held my cue. "I was rolling around in bed with stomach pains this morning and they got worse and worse. "My mate took me to hospital at about 5.30am and I was put on a drip. But I told the hospital that I had to play at the tournament and discharged myself. "I was really tired because I hadn't had much sleep. I never imagined I would make a 147. "It hurt when I lent over the table but I used the rest, which helped." Ford will pocket £24,000 unless his 147 break is equalled. O'Sullivan demolished Dominic Dale 4-0, notching breaks of 99, 72 and 95, and then beat Gerard Greene for his fourth successive victory. Greene is still on course to qualify for the next phase, although if Dale beats him 4-0 in their final match it would be he who progresses. Davis will face O'Sullivan in his final match having seen his chances of reaching the last 16 crushed by Ford. Reigning UK champion Ebdon defeated Welshman Matthew Stevens 4-1 before securing a 4-3 victory against Dave Harold. Earlier in the day, Harold knocked a career-high 143 break in a 4-1 win over Joe Delaney. Joe Swail extended his unbeaten run in the group stages with a 4-0 thrashing of Mark Davis as well as a 4-2 win against defending champion Neil Robertson, who has now won two and lost two of his group matches. Robertson must win his final group match on Tuesday to stand any chance of going through. Meanwhile, World Championship runner-up Mark Selby gave himself a welcome boost with 4-1 wins over Chinese prospect Liu Song and Dubliner Delaney. But having lost to Stevens and Harold on the opening day, Selby must beat Ebdon in his final match if he is to progress. Another ex-world champion, Shaun Murphy, let a 3-1 slip lead against Hong Kong's Marco Fu as he suffered his first group defeat. 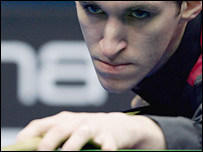 But having won his three previous matches, Murphy will qualify if he beats Ding Junhui in his last match.